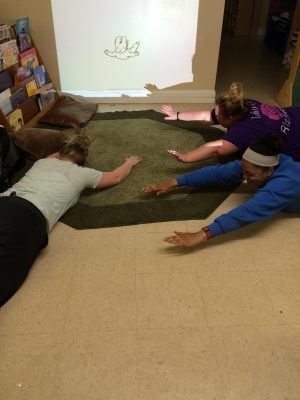 Our teachers learning and understanding the natural movement of babies. baby containers like car seats and harnesses. All teachers at OECC participated in the seminar and enjoyed the presentation’s many different activities. To get into the mindset of the baby, Shannon had the teachers move as a baby would. Our teachers crawled on the floor, learned how to turn over, practiced reaching, and performed other typical baby moves. They learned the movements the babies need to learn by building their core muscles and how to interact with their environment. These exercises emphasized that when babies are confined to containers like walkers and harnesses, they don’t develop as well as babies who are on the floor and allowed to move freely. According to the Mayo Clinic, in addition to the inability to strengthen their bodies and explore their world, babies who spent long periods of time in containers like car seats could develop a flat spot on the back of their head. There is also evidence that confined babies have higher incidences of developing ADD/ADHD later in life. By allowing your baby to freely move, you are giving them the opportunity to make mistakes and learn from them. The teachers also watched a video presentation about a forest kindergarten in Denmark. There, children “run wild,” learning to be careful and respecting boundaries. For example, the children can run freely, but know that they shouldn’t go in certain places, like near a river, without an adult. This video tied into the seminar by showing that when children are allowed to move freely and learn on their own, they will make mistakes and correct themselves—learning confidence and independence. If you are using baby containers like walkers or jumpers to keep your baby while you do other tasks, it’s recommended that you switch to a play pen instead. Not only is it a safer alternative, but your child or student can move freely within it.